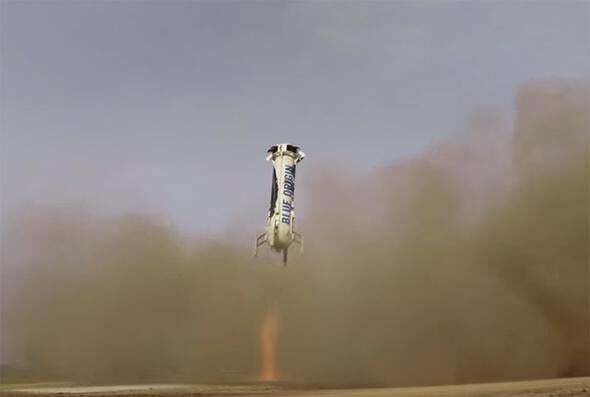 Blue Origin: Successful test launch and vertical landing of New Shepard rocket. The New Shepard rocket, moments before its first successful landing after a trip into space. Jeff Bezos’ rocket company Blue Origin just surprised everyone by revealing its New Shepard* rocket reached an incredible milestone on Monday: In a test run, the rocket took off vertically, reached space, then landed again vertically minutes later. The rocket launched from their site in west Texas, accelerating to a top speed of about 4,600 kph, and achieving an altitude of more than 100 kilometers, the technical height defined to be the start of space (called the Kármán line). 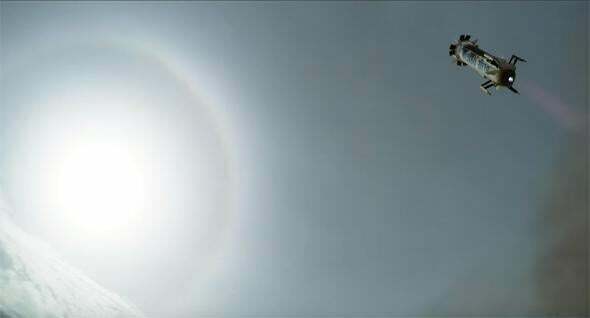 They also deployed the crew capsule at a height of about 6 km above ground, which parachuted safely back to Earth. I like the shots of the landing from various angles at the video’s end; it looks more like a Hollywood sci-fi movie than reality! But real it is. The descent is unnerving; the rocket engines don’t reignite until it’s only about 1,600 meters above the ground, and it decelerates pretty hard. That saves a lot of fuel and makes perfect sense, but it’s a little scary to see it! Still, the rocket performed extremely well, and landed only a little over a meter from the center of the launch pad. Amazing. Blue Origin attempted a similar test flight in April, but the landing system hydraulics failed and the booster crashed. Apparently, and happily, this issue has been addressed. So congratulations to Jeff Bezos and his team on this incredible test! This is very exciting to see. A different angle on the landing. The Sun and tilted horizon are on the left. However, I’m seeing some confused coverage of this event, and I want to clear a couple of things up. First, yes, this launch is a big deal! It shows that Blue Origin is making excellent strides towards commercial space launches, a field currently dominated by SpaceX. Getting up to the Kármán line is a major achievement at all, let alone successfully deploying the capsule and then landing the rocket again. SpaceX itself is based on the idea of competing against big government contractors, so competition for them is good. I smiled, but I have to point out that, as great a technical achievement as this was, what Bezos has accomplished here is quite different than what Musk has been attempting. The Blue Origin New Shepard is a suborbital rocket, designed to go straight up into space and back down again. The SpaceX Falcon 9 is an orbital rocket, which takes vastly more energy (in other words, much higher speed) to achieve its goal. He’s right. Landing a booster from an orbital flight is hugely harder than from a suborbital one. For orbital flights, the booster not only has to move far faster, it also will have a large horizontal speed relative to the ground to get to orbit, so slowing it is more difficult as well. SpaceX has not yet achieved a successful landing this way, but what they’re doing is literally an order of magnitude more difficult than what Blue Origin did. True, but Grasshopper (a test vehicle designed to launch and land vertically) only got 744 meters above the ground, wasn’t designed for high-altitude flights (it’s a testbed for the F9 landing tech), and didn’t deploy a capsule. The later F9R tests based on Grasshopper were very successful as well, but only got a kilometer off the ground. What Bezos did yesterday was far more technically difficult. Update, Nov 24, 2015, at 18:00 UTC: Musk has continued to tweet about this, correctly pointing out that suborbital flight and landing has been done before by SpaceShipOne and arguably the X-15 rocketplane. Musk also noted the series of water landing attempts using the F9 booster. Mind you, suborbital flights are important. It’s more than just a tourist attraction (though a pricy one); real science can be done on such flights, even though weightlessness only lasts a few minutes. Blue Origin looks to be getting quite close to having the ability for these kinds of launches. The company is known for secrecy, tending to announce achievements only after they’ve been reached. That’s understandable, and it can work to Blue Origin’s advantage in the media as a tortoise-and-hare story (one I think Bezos is happy with). That means details about their future goals are unclear, but the goal itself is obvious: getting in on the lucrative orbital satellite market as well. As I pointed out, the physics of this is quite different, and it’s a long journey there … but they just took a solid step in the right direction. Up. And back down again. Correction, Nov. 24, 2015: I originally misspelled the rocket as New Shepherd; but it’s punningly named after Alan Shepard, the first American in space.